It’s a New Year, and another new take on life from Bright Club. We’re back at the Wilmington Arms on January 18th with old friends and new ones. The festive season started here. David Morgan filled us with holiday spirit and revealed that his favourite source of happiness is vengeance. Kathryn Waddington (City University) revealed how nurses stay happy despite the medical emergencies happening around them. Kath Woolf (UCL) explained that the mental wellbeing of a million people depends on you. Time to cheer up! Ian Roberts (LSHTM) sold us a new happier future, with less oil. 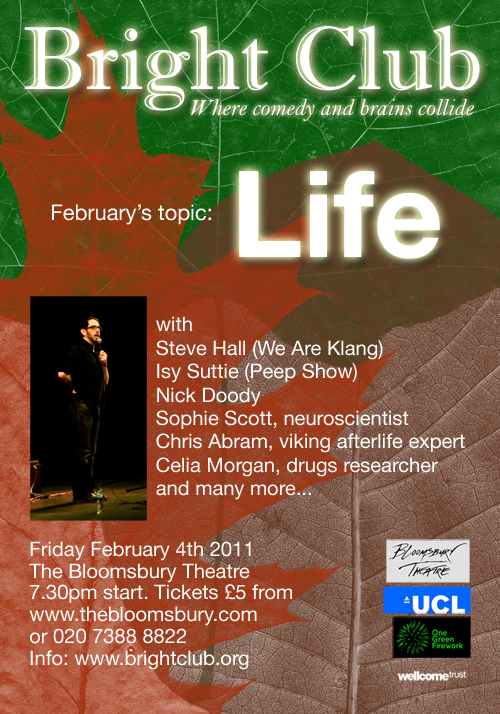 Sophie Scott (UCL) told us why we laugh and how comedy and neuroscience are natural bedfellows. Vince Mitchell (City University) told us what to spend our money on for a truly happy Xmas (and life). Charlie and Sam from Glitter & Doom played rock Xmas carol karaoke, with a little help from Meringue (Neil). Even Steve and Miriam sang. Miriam new beforehand that she was going to sing. Steve did not. 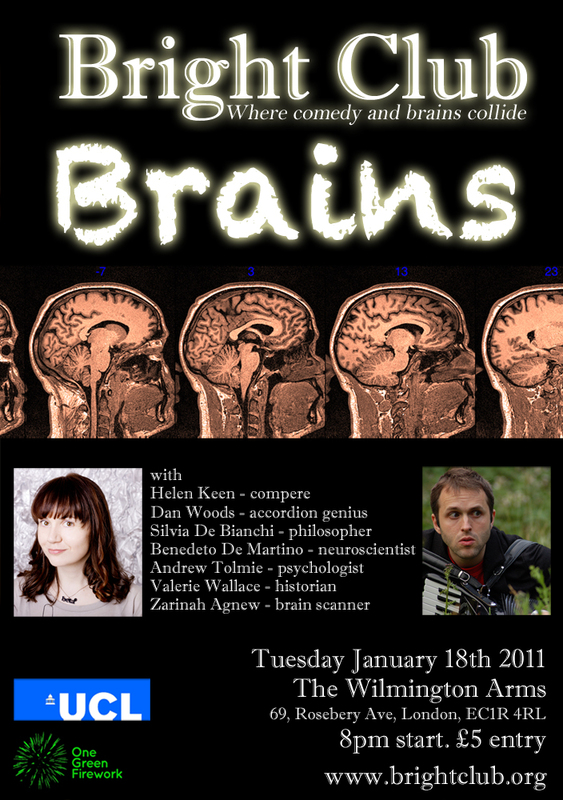 See you on January 18th for Bright Club: Brains! February 4th Bright Club: Life. BACK AT THE BLOOMSBURY! After a complete sellout of the Bloomsbury Theatre in October Bright Club returns. This time we’re looking at LIFE. What is it? Where did it come from? How does it work? What on Earth are we going to do with it all? and Dean Burnett, brain man, homeopath teaser and science fan.